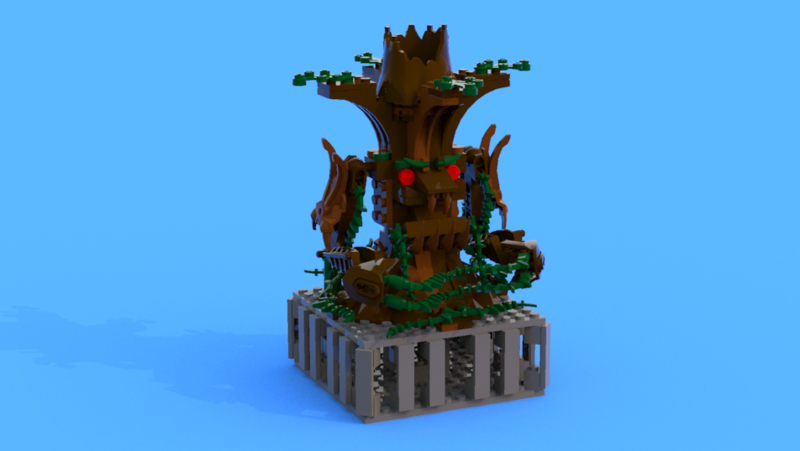 I'm a fan of the game of chess, and I've always wanted to create an LDD Chess set. 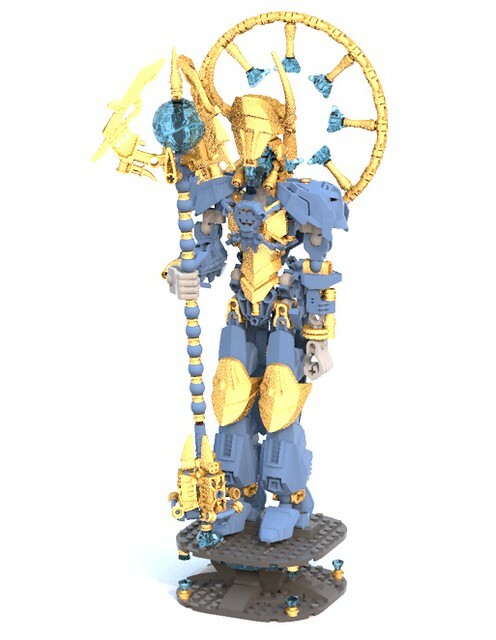 So three months ago, I approached TheOneVeyronian about collaborating on an LDD chess set with constraction figures as the pieces, after having seen her stellar work on LDD models. And so began a large collaboration project, one that spanned almost all of summer. And it brings me great joy to be able to share with you the fruits of our labor: The CCBS CHESS COLLAB! The Dark Side Pawns are akin to alien drones, and are the children of the Queen. Usually, chess pawns are uninteresting at best, but TheOneVeyronian tried to give each of the 8 pawns some individuality, altering their secondary colour but keeping their primary colour black. 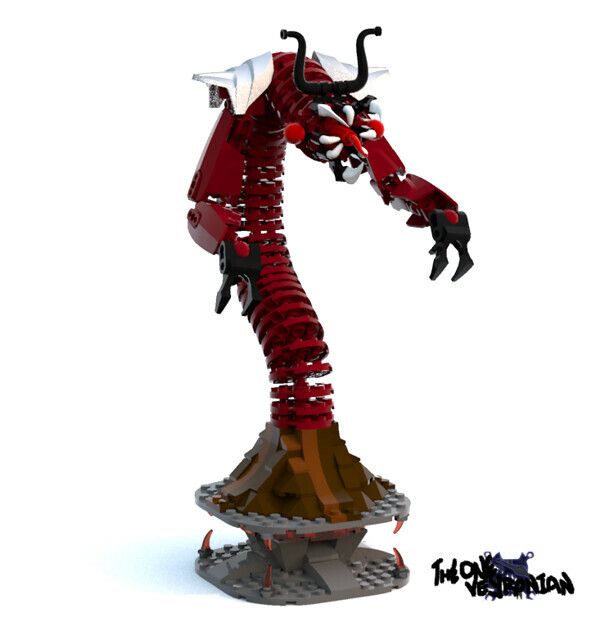 This originally started out as a mutant tree, however, when TheOneVeyronian compared its size to the rest of the figures, she went back and revised this piece completely. All that remains of the tree is the stump, and now it's home to a giant mutant worm (and her personal favourite ). Mother of the Pawn characters and the most powerful piece in Chess, it was only right to make the Queen the most beautifully grotesque insectoid being I could. She looks beautiful, kind and caring to the Dark Side characters, but hideous and absolutely deadly to everyone else. Lastly the KIng, a mutant 4 armed insectoid centaur (goodness knows why) with an affinity for dark blood rubies and ridiculously oversized crowns that looks more like a conical hat. He lets his wife the Queen do all the fighting and prefers to try and not get involved. My idea for those was to remotely resemble Roman Centurion warriors, with the Shield and Helmet clearly conveying that part. However, I opted in for an axe as their main weapon since LDD did not have a sword shape that I felt would suit them. 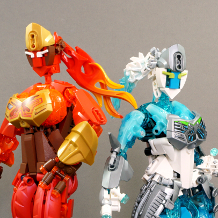 You'll notice that there are slight color variations across them, with some parts of them in different trans colors. Those are to keep the pawn pieces distinguishable if an actual game of chess was to be played using this board (LDD file). Originally I was trying to build a Machine Golem or some sort of Construct Being, but then I opted in for a kneeling, hammer-wielding warrior that towers over the pawns. One of my favorites in spite of its relative simplicity, particularly the shoulder armor bit. The crown jewel of my creations (on this board that is!). I've been forever trying to make this head design work with a beak that wasn't absolutely misaligned and silly-looking, and I think I managed to pull it off! I'm also proud of how the wings turned out. This bad boy is also a mount for a Knight, which you can see better by clicking the link to the spinnie! One of my more "ordinary" looking characters, and featuring a decorative ornament design on the back. I quite like how I did the head as well as his shoulder armor. Her Royal Highness is a decisive Seraphic Queen, a conqueror of the shadows and a force to be reckoned with. 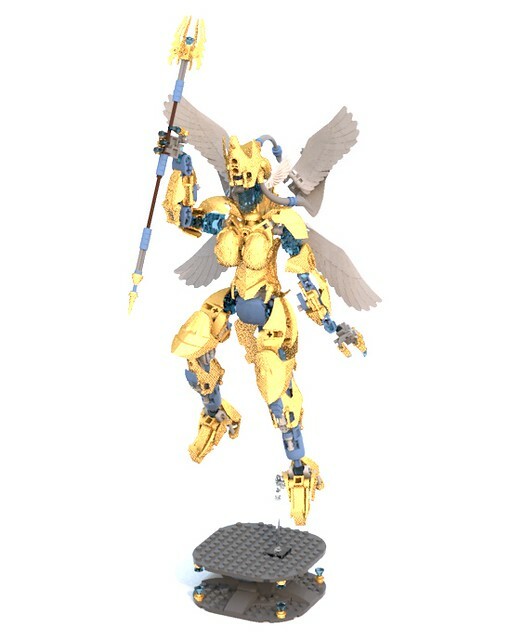 The hovering stance along with the wings help accentuate the versatility and sheer power of the Queen as a chess piece. This is basically a revamp of one of my older builds, with a few changes made to it to help it better fit the role of Queen. 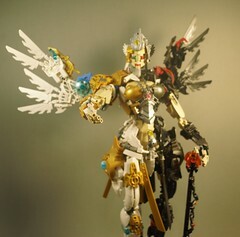 The parts that have been modified are mainly the head, shoulders, addition of wings, and the staff. Click here if you want to see what it was before. The King, quite honestly my least favorite piece, but the biggest on my side of the board (if I remember correctly). I like how the head and sword turned out, but not much else to be quite honest. I think the cape could still use a bit of work, but by the time I got to the King I was itching to complete the whole build. 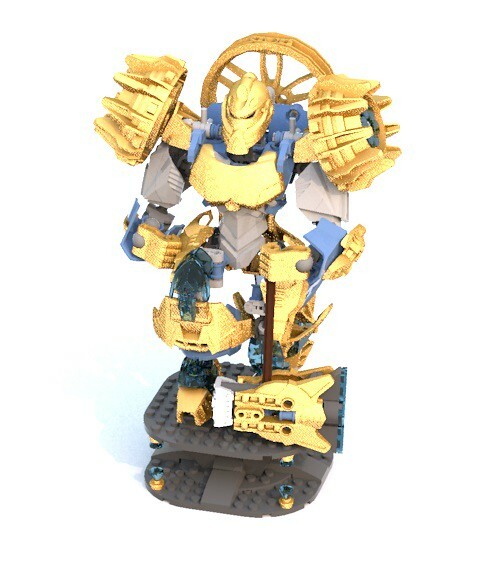 Nevertheless, I still enjoyed building it, along with every other character in the Light Faction. Credit goes to TheOneVeyronian for the renders of all the pieces as well as the spinnies. I was responsible for designing the chessboard as well as modifying TheOneVeyronian's initial base design. The entire project comprises over 8000 bricks, and took us almost all of July and a good portion of August to hatch out, with our plan to design one piece each week. Edited by -Windrider-, Oct 20 2015 - 06:30 PM. I saw this on Flickr, and it is HUGE. 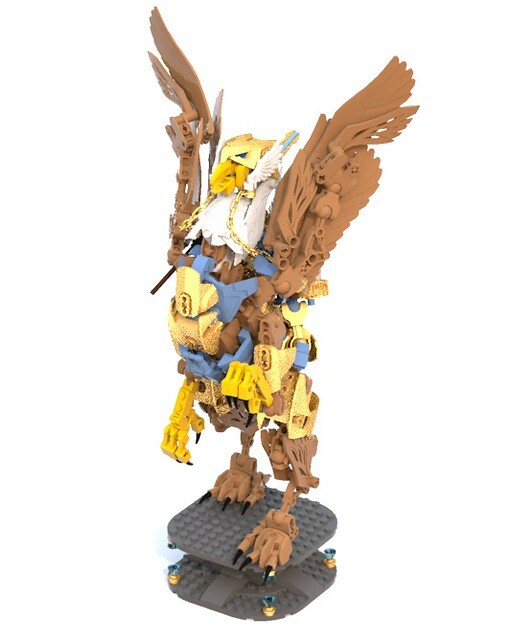 The Griffin is by far my favorite due to that head. You did pull it off will. The Dark Knight(no not batman) I don't like so much, It just looks a bit... Awkward. The Worm is also Pretty Great, it just flows together so well. And isn't the Batman reference a joke I used in my own piece descriptions? If you see a creative topic from me, I'd appreciate a comment on it - it's how I learn and become better at what I do! How the heck do you make your own profile invisible to others, Veyronian? I like the idea of making the pawns more interesting and while the mutant ghost horse knight s a cool looking piece, I don't feel like it fits in since... Well, it's a horse and horses aren't insects. The rest of the models are impressive and I like the work that you and Mohammed put into this CCBS chess set. If you like Pingu & want to support a good project, click here. Also, I've rejoined the BZPRPG & I have a new profile for a new game. Click here to see it. 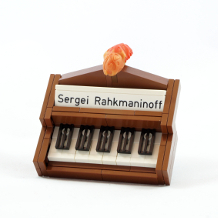 I saw these on Brickshelf yesterday, and man, was I impressed! The amount of work you guys must've put into these really payed off! I'm especially a fan of the Light Pawns, and Rook, and Knight, as well as the Dark Bishop. 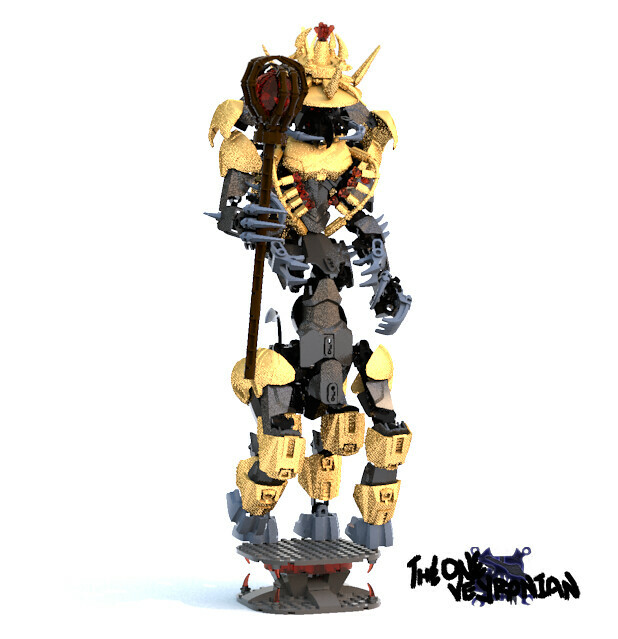 Mata Nui, this is fantastic! It looks a little odd that the dark knight's rider doesn't really actually seem to be riding him, and the dark queen's waist seems a bit disjointed, but I'm hard pressed to come up with any other quibbles. 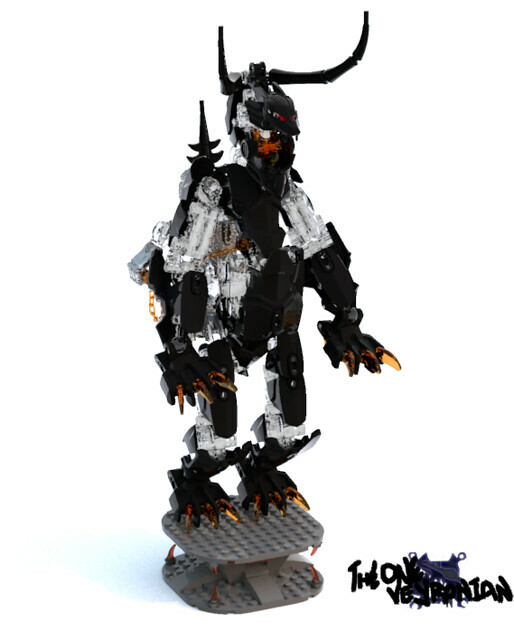 The griffin and light queen are probably my favorites, for the incredible shaping I wasn't even sure was possible in LDD, and I also really like the dark bishop - he simply looks very solid and intimidating, especially wielding a club of skulls. I'll also point out that the usage of spacers and ball joints on the light bishop's staff is a marvelous way to spruce up an otherwise boring axle, and Meltdown's head as the king's beard touches genius. Overall, a work truly inspiring, especially given often difficult digital medium in which it was devised. I wouldn't be at all surprised to see this hit the front page. Great job, you two. These are amazing creations, especially the beautifully sculpted griffin! Huge thanks to all of you who have had things to say about this project! Be certain that this is not the only Collab we'll be doing together. Stay tuned for more coming soon(ish)! This is fantastic, personally, I think my favorite of them is the Dark Bishop. Ho-lee... this is breathtaking. I can't believe the scale you managed to achieve with this project. This much have taken so much patience... I really have no words. You blew my mind. I'd love this to be sitting on my table. It's just... glorious! Most vile, O trick of the Empire's basest wit. A snare, a ruse, a ploy: and we the fools. During a Skype session with The~1st~Shadow, we tried calculating how much this would cost... the answer? Over $1000. This is a monumental feat, and I'm still impressed by it every time I see it. Nothing I say could do it justice. This is a work of pure art. Thank you and keep up the good work. I have no words to describe this. Just one rook would amaze me... now 31 other pieces? Wow. Ha! I tricked you into reading my signature! Grats on getting featured, this absolutely deserves it. A large-scale chess set is an amazing idea for a MOC, and it came out fantastic. Every piece is so intricate! Wow! Now this is an incredible piece of art. It's truly a Masterpiece, a Masterpiece made of LEGO Pieces! 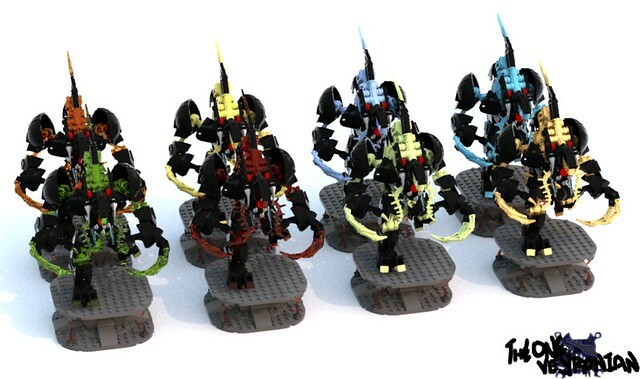 I would buy some of these guys if LEGO ever made a series, but that's just dreaming. I love the color schemes. The variety is so big, There is Black all the way to Sand Blue! 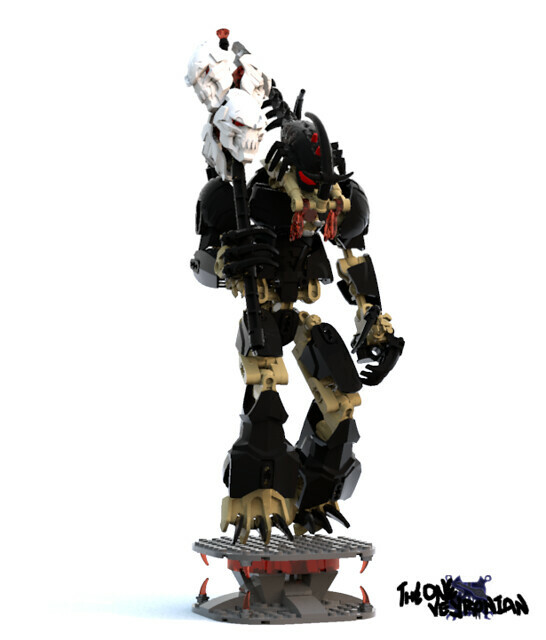 Some of the building techniques are really innovative and neat, such as the use of some masks and heads (the Furno 3.0 or Metus helmet/mask as the griffin's "crown", and as another member mentioned, the Meltdown head) . 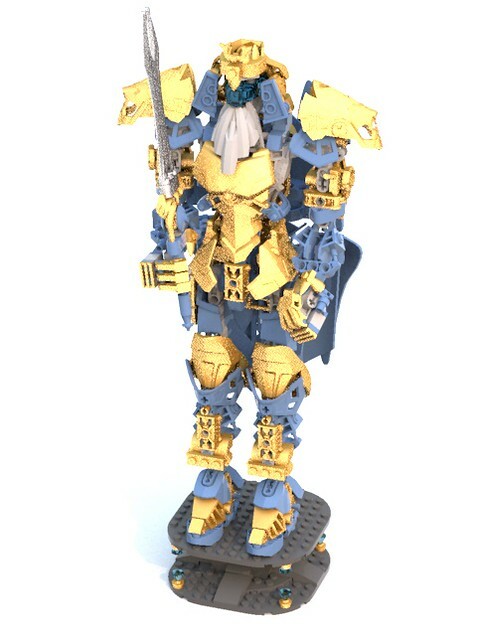 Overall, this MOC may just be my favorite MOC I've seen on BZP so far. Great Job guys! 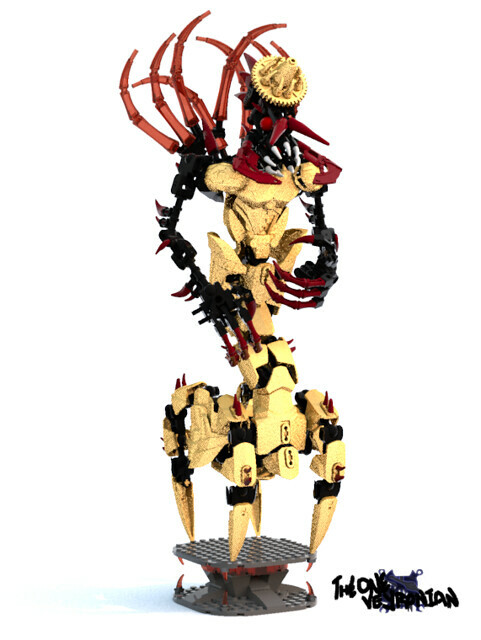 I would like to see some of the characters up on Lego Ideas so they could possibly be made into real sets. 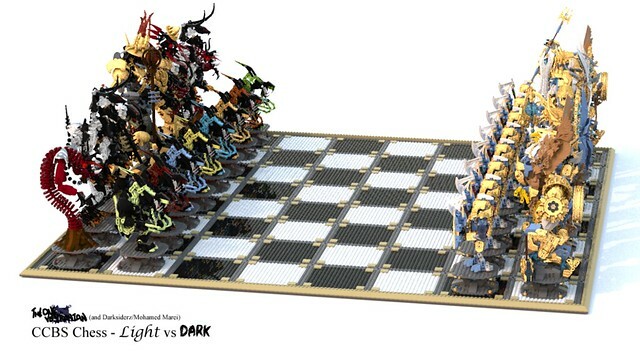 I would absolutely buy the whole chess board and characters if it was made into a set. 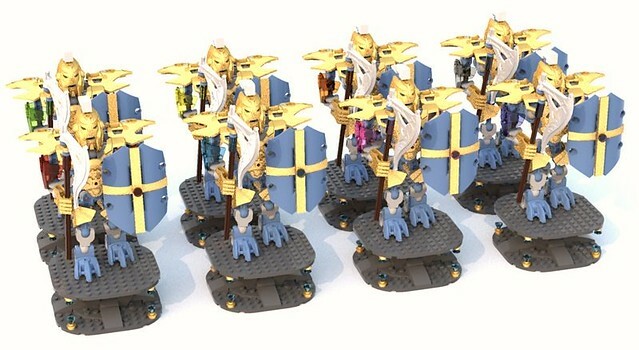 I really do suggest you put some up on Lego Ideas, especially the light faction pawns, bishop and knight. Plus the pawns for the dark faction but I like the trans red version. I tried to download the file for the whole chess board but when I went into build guide mode it crashed LDD. I think it might just be because of all the bricks in it. So I would suggest that you just download the individual files for each one if you want to see how they're built. Edited by -Windrider-, Oct 22 2015 - 02:02 PM. Thank you so much guys! Word of caution: Unless your PC is powerful enough it probably wouldn't be a great idea to try and open the whole file. It took us ages to stitch it together because of how heavy and complex the whole thing was! If anyone has ideas for future collaborations we'd definitely like to hear them! 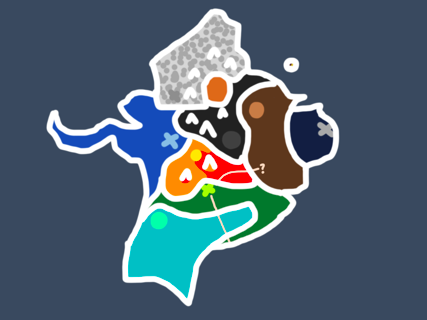 Just PM me or TheOneVeyronian, and we'll try and work over some stuff in December/January time. Edited by Mohamed Marei, Nov 19 2015 - 06:22 AM.